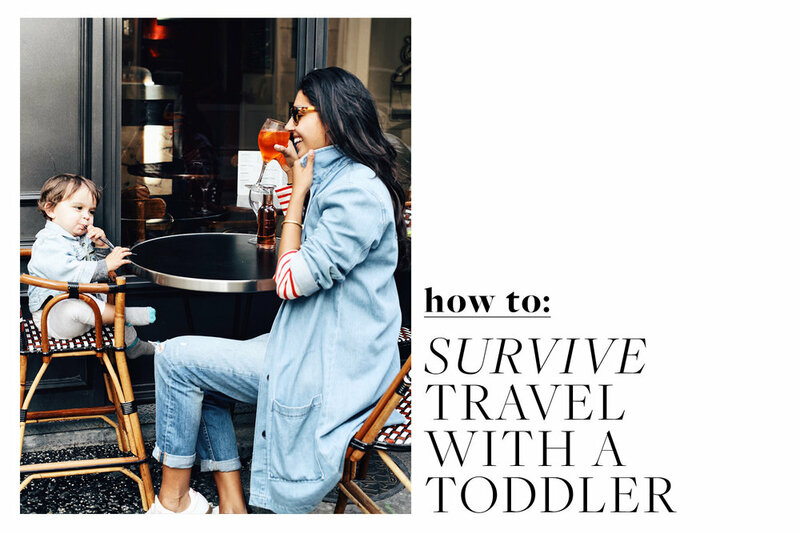 Traveling with a toddler is totally different than traveling with a baby. For one thing, Charley has a major appetite, and he just seems to be hungrier when we're on a plane. This was no problem when he was an infant; we would bring chilled breastmilk or formula to make, and that was plenty. But now that he's 17 months old, he wants food. Real food. And airplanes don't usually have the best options. When it comes to travel, never leave home without snacks! I was skeptical at first about baby food pouches...they're packed with sugar and preservatives, and felt like a waste of money. But after doing a bit of research, I finally found a few brands I love. My favorite are Happy Baby Clearly Crafted. They have the least amount of sugar and use ingredients like quinoa, chickpeas and basil. Yum. Plum Organics also have some great options. We only use these on travel days and they're almost always better than whatever is available on the plane. For liquids, you're still allowed to bring as much as you want when traveling with a young child. I keep one of these filled with water for his sippy cup (insulated so everything stays nice and cold!). You can also fill it with milk, but lately, I've been stocking up on shelf stable milk packs so we don't have to worry about refrigeration (I like Horizon Valley Organic the best). Keeping a toddler entertained on a flight is no easy feat. With most of our family on the East coast, we have to take long haul flights quite frequently and that means always staying one step ahead of the baby. I like to have a loose plan in my mind of how the flight will go including meal times, games/toys and some screen time. I always make sure to have a few shows downloaded on my phone (easier to hold for little ones than a giant iPad) now that he's become more interested in cartoons. When Charley becomes bored with one thing, we move onto the next, stretching each activity out for as long as possible, including ripping up the in-flight magazine. My best advice is to have a new, inexpensive toy that can be used as an absolute last resort to keep your child entertained if and when all else has failed. Having space is important, too. If it's at all possible, buying a seat for your little one will make the entire experience much more pleasant. Even though technically Charley can still fly for free (children under 2 are considered "lap infants" and don't need their own seat...), it's so much better when he has his own seat and we can stretch out in an entire row. For short flights, it doesn't always make sense, but for anything more than 2+ hours, we usually pay up and get him a seat. Packing light with a kid in tow is nearly impossible, mostly because of all the gear that is required (car seat, stroller, etc. ), but I like to think we have our kit pretty streamlined. At home, we love our car seat, but at nearly 30lbs, it's way too big and bulky for travel. We bought this inexpensive option as our "travel" seat and it's easy to clip into rental cars and taxis using the seatbelt. We gate check it as soon as we get to the airport using this protective bag to keep it safe (and as a bonus, throw a few extra diapers and what not in there). We use this as our travel stroller and constantly get asked about it; it folds down completely with the push of a button, fits through the airport security machines and in the overhead bins and weighs 11lbs! If we are going on a ski trip and need bigger wheels, we bring this stroller and check it plane side. If you're worried about it getting damaged, you can use this bag to protect it, but we have never had any issues without it. This is the one thing we never leave home without. Some people prefer an app, but I like to have my phone free during naps and nighttime sleep. It goes into our hand luggage just in case the airline loses our luggage (you never know). When Charley was younger, we used this as our failproof method for getting him to sleep on planes. It worked like a charm on our overnight trip to Paris and he had a fairly long stretch of sleep in the middle seat between my husband and I (we however didn't sleep a wink...). Now that he's bigger, I'm not sure how much longer this trick will work. My best advice is to schedule your flight around a nap time and bring a comfort object with you to promote sleep on the plane. If all else fails, curl up with a show and at least have some "quiet time", which can be a big help for a hyped up baby. We've been fairly lucky in that Charley has had consistently good sleep when traveling to new places. I think this is because we started a bedtime routine so early on and it's still exactly the same every night, no matter where we are. : A warm bath, pj's, a book and a cuddle. I always pack our bedtime book, his lovey, a comfy pair of pjs and crib sheet from home. When crossing time zones, the first day or so might be bumpy, but I generally try to get him adjusted to the new time zone right away (unless it's a super quick trip, but it usually isn't). Charley isn't much of an "on-the-go" napper, so we plan our day around his nap schedule which allows him to be well rested and well behaved when we are out an about. I don't mind doing this because I can usually use a break too! I'm a big believer in the buddy system. My husband and I have a tag team approach to travel; we both have the same goal and try to keep the in-fighting minimal. It's hard to stick to a strict schedule when you're on the road, so we both try to stay flexible about things (easier said than done, but we try!). We celebrate the mini-victories and laugh off the major fails. Same team, same dream.